Spicy pickle chips in a Mason jar by Ball. Photo by Elvira Kalviste | THE NIBBLE. This is Page 4 of a 5-page glossary of different pickle types. 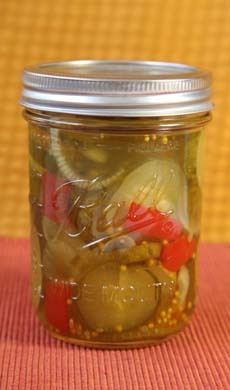 Some of the terms below include mason jar, pepperoncini and pickled peppers. After you’ve peeked at the pickles, take a look at our many other delicious food glossaries—an easy way to get up to speed on more than fifty different food categories. Mass-produced glass jars for home canning, invented by Philadelphia tinsmith John Landis Mason and patented in 1858. They are also known as Ball jars after an early manufacturer of that name, plus fruit jars and glass canning jars. Today the Ball and Kerr brands are manufactured in the U.S. (by the same company), in a variety of diameters and volumes including half-pint, pint, quart and half-gallon. Food is packed into the jar ad the lid with a rubber seal is placed on top. A metal band is screwed loosely over the lid, allowing air and steam to escape as the jar is heat-sterilized. When the jar cool, a vacuum is created, pulling the lid into a hermetic seal. See photos above and below. Oshinko, along with tsukemono, is a general Japanese term for pickles. 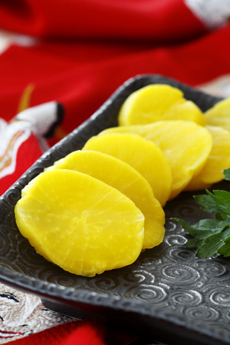 Many different fruits and vegetables are pickled and served as side dishes with Japanese cuisine. See also tsukemono. Takuwan, pickled daikon; one of our favorite oshinko. Photo by Katharine Pollak | THE NIBBLE. This pickled pepper is a medium-hot chile, grown in Italy. 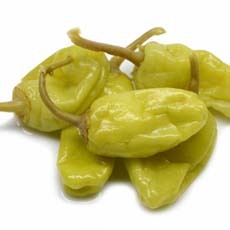 They are also called Tuscan peppers or golden Greek peppers. Pepperoncini are popular in antipastos and Mediterranean-style salads and are sliced into cold rice and pasta dishes. They can be stuffed with mozzarella and other cheese. Pepperoncini. Photo courtesy Mrs. Klein’s Pickle Co.
Chips, a.k.a. slices, are meant to be served on (or with) hamburgers and sandwiches. Popular varieties include bread-and-butter, genuine dill and kosher dill. Pickle chips are available in smooth or waffle-cut styles. Waffle-cut places ridges across the face of the pickle. Photo by Mary K. Baird | MorgueFile. More than 15 varieties of chile peppers are pickled in the same way as cucumbers. They range from mild pepperoncini to banana peppers to the hotter cherry peppers and the very hot pickled jalapeños. They are available whole and in rings, which are used to garnish hors d’oeuvres, salads and sandwiches/burgers. Pickle chips, in a Mason jar manufactured by Ball. Photo courtesy Heinz. Almost any vegetable or fruit can be pickled. Aside from cucumbers, cabbage (sauerkraut) is the most universally found. Some of the more popular pickles include asparagus, beets, carrots, cauliflower, cocktail onions, green tomatoes and okra. 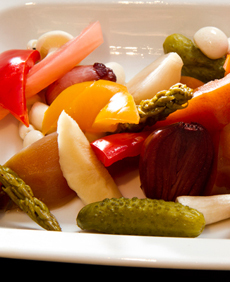 See our review of Tillen Farms pickled vegetables. Each pickler has his or her own favorite blend of spices. Pickling spices are also sold as a spice mix, and can include allspice, bay leaf, cardamom, cinnamon, clove, coriander, crushed hot pepper, dill seed, ginger, juniper berry, mace, mustard seed and peppercorn. More modern cooks will include curry, wasabi soy sauce and other international seasonings in their brines. Any vegetable or fruit can be pickled. Photo courtesy The National Restaurant | NYC. A garlicky pickle, similar in flavor profile to the kosher dill pickle. 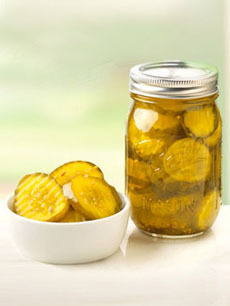 Most pickles are produced by one of three methods: refrigerated, fresh-pack or processed (also called cured or fermented). Each method creates distinct flavors and textures. Additional flavors are achieved by adding different herbs, spices and seasonings to the brine toward the end of fermentation. See also cuts.